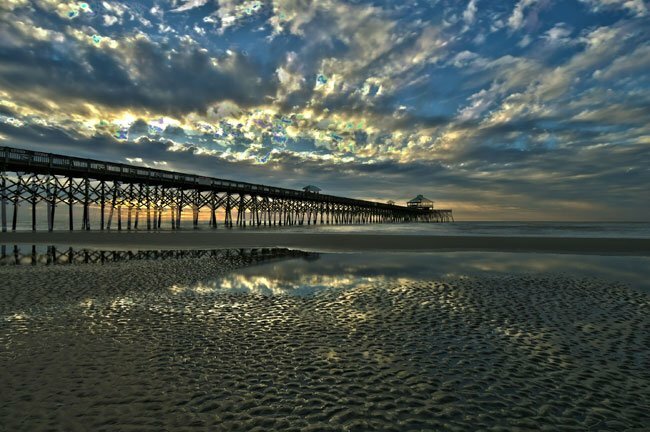 The Edwin S. Taylor Fishing Pier on Folly Beach was built in 1995 and extends 1,045 feet into the ocean. It culminates in a 7,500 square-foot covered platform that affords an amazing view of sea and sky. 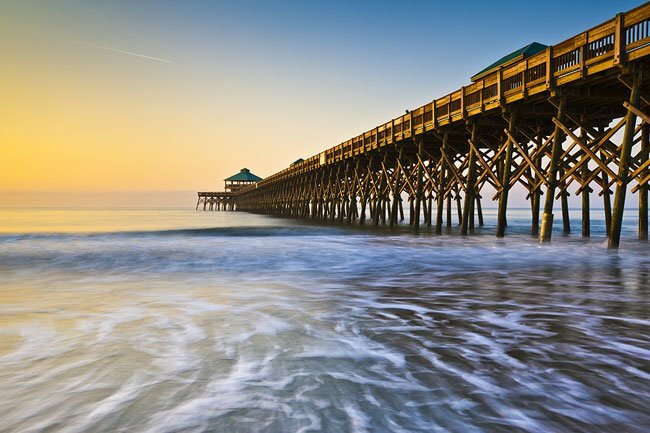 Folly was home to two piers before this one. 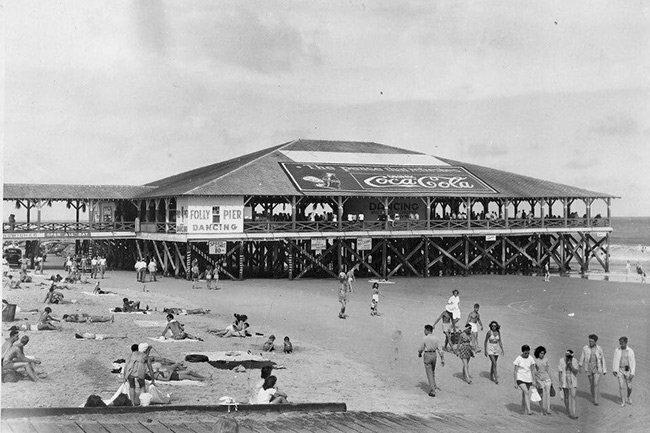 Like today’s pier, they also served as social centers for the island. 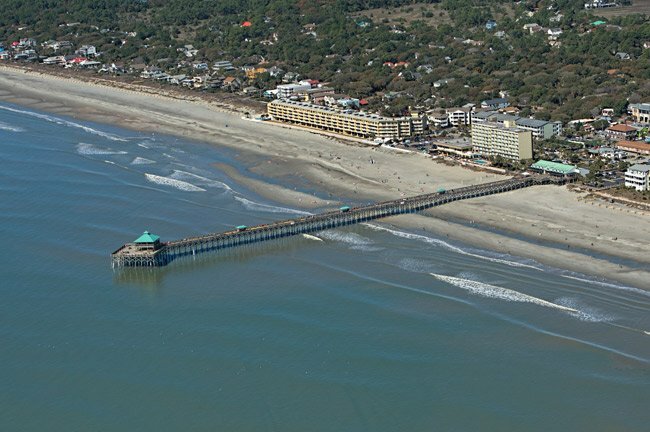 The first pier was built in 1931, along with a pavilion, boardwalk, and the Oceanfront Hotel. In those days, you could catch an afternoon or evening concert featuring such big-band giants as Glenn Miller, Guy Lombardo, and Tommy Dorsey. It was also the scene of several beauty contests, one of which was judged by the legendary George Gershwin, who summered on Folly in 1934. 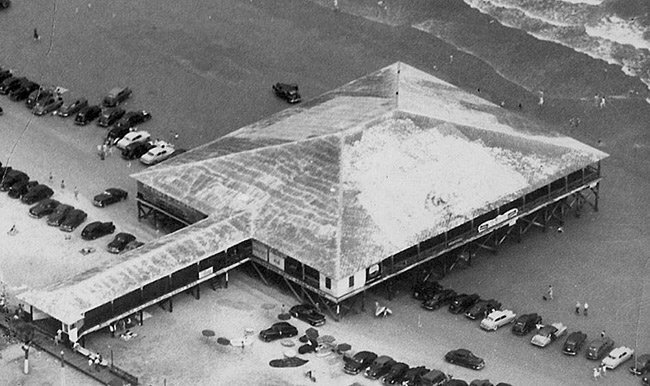 That pier burned in 1957 but a new one soon replaced it – surrounded by a 1,700-foot boardwalk and a modern hotel. 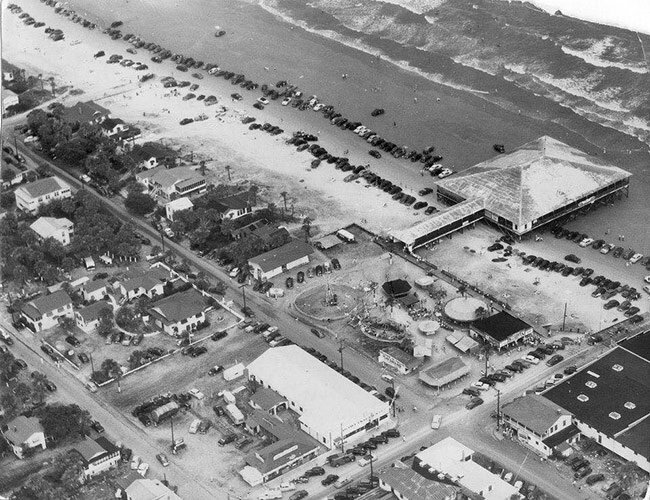 Called “Oceanfront Plaza,” the area also featured a skating rink, a bowling alley, and a small amusement park complete with a Ferris wheel, a roller coaster, and a merry-go-round. 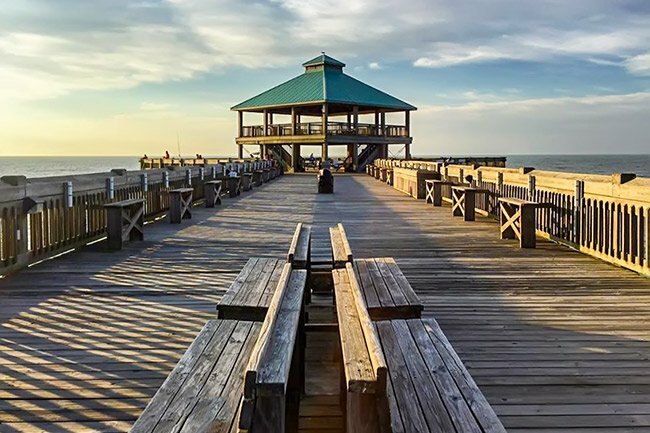 Like its predecessor, the new pier attracted plenty of famous musicians, including The Tams, The Temptations, Maurice Williams and The Zodiacs, The Catalinas, Doug Clark and The Hot Nuts, Jerry Lee Lewis, and even the inimitable Otis Redding. Throughout the ’60s and ’70s, young people flocked to the pier to dance the night away. Its giant windows offered wonderful breezes, and you could catch your breath, talk to friends, or share a drink with your date while staring out over the ocean. 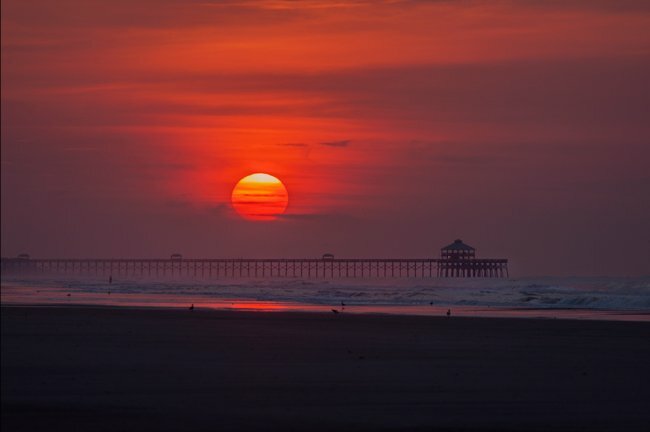 Sadly, the pier burned again in 1977 and there were rumors of arson. 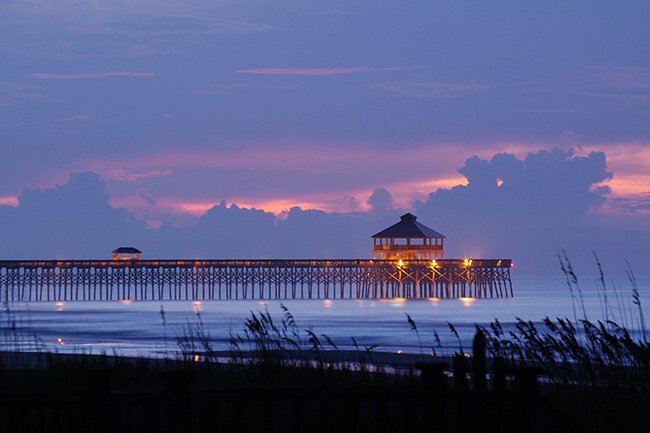 Folly did not have a pier for the next 18 years. 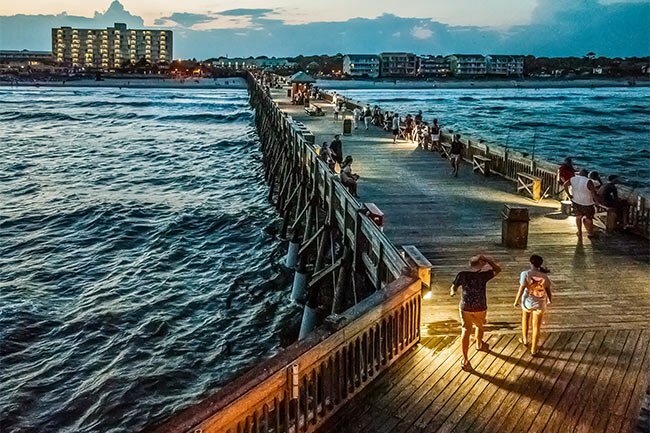 In an entirely different vein, the current pier revolves around fishing. 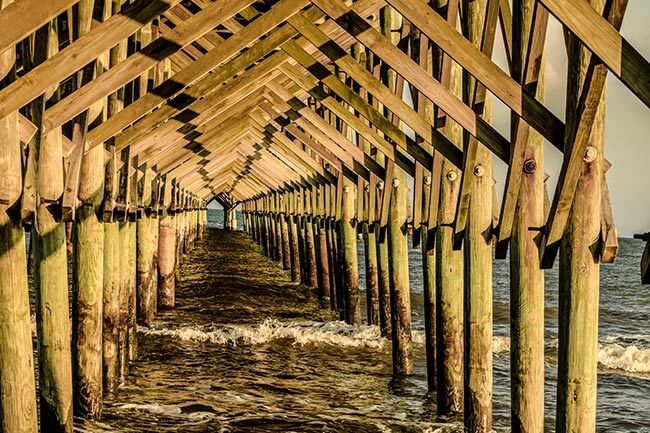 At 25 feet wide, it stands 23 feet above sea level. 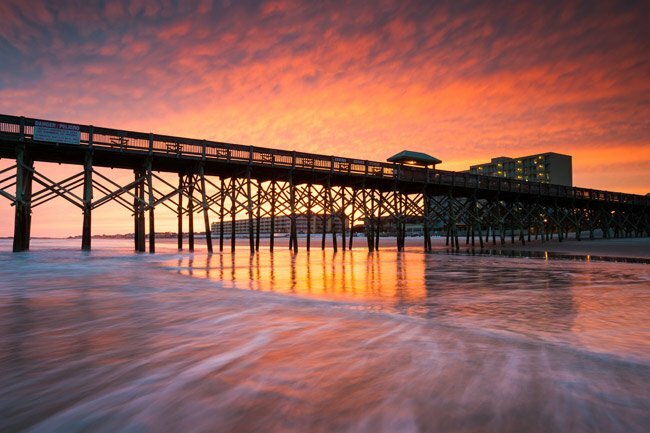 At the foot of the pier, you can also find a sit-down restaurant, an upscale gift shop, rod and tackle rentals and sales, a lower patio space available for rent, beach access, and showers. 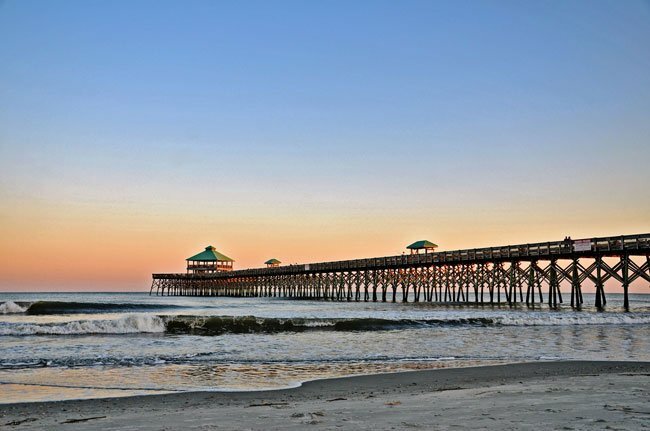 The Charleston County Park & Recreation Department hosts monthly fishing tournaments June through September, and the Big Kahuna tournament is held in August each year. 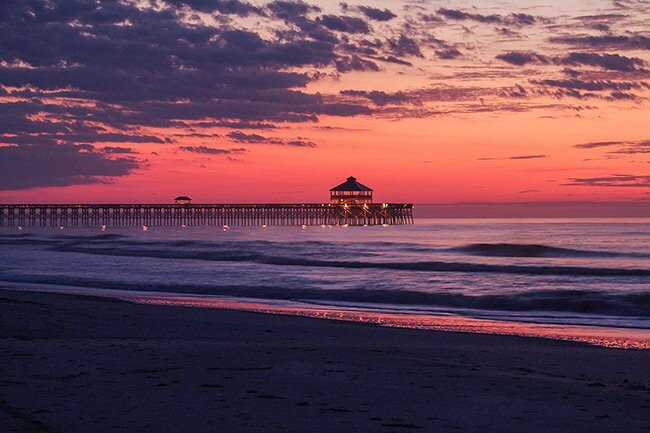 In a nod to Folly’s past, it also hosts Moonlight Mixers once or twice a month during the summer. The following three images are from the collection of Maebelle Barnett Bazzel, a lifelong resident of James Island in Charleston County. 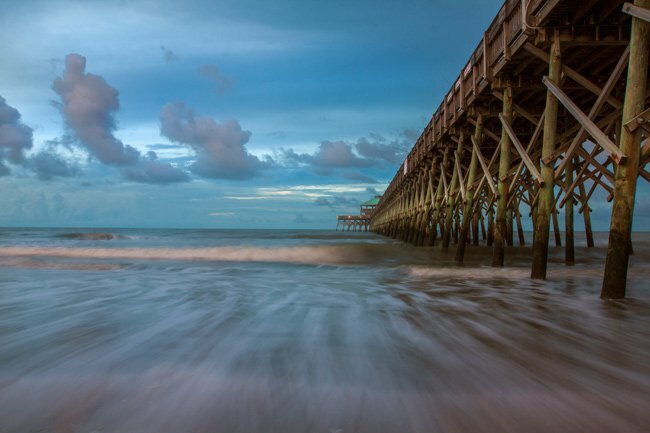 Most of the views of Folly Beach are from the 1940s-1950s. 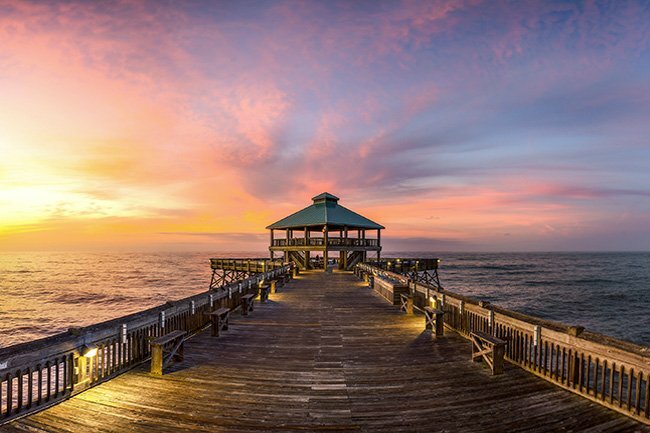 The Folly Pier with Pavilion, built in 1925 by Ted Shiadaressi, burned down in 1957. 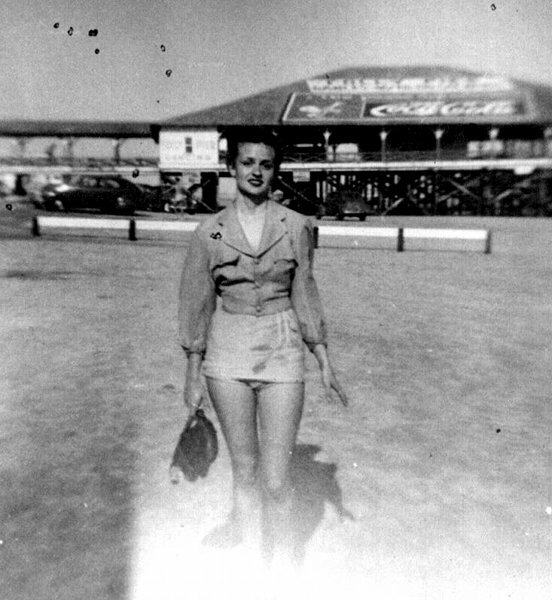 I was raised on Folly Beach in the 1950s. We lived on 108 E. Arctic and were owners of the Catalina Lodge at that time. On sand dune from the water. Does anyone have photographs of our old business and home? You are absolutely going to love it! Welcome to the area! 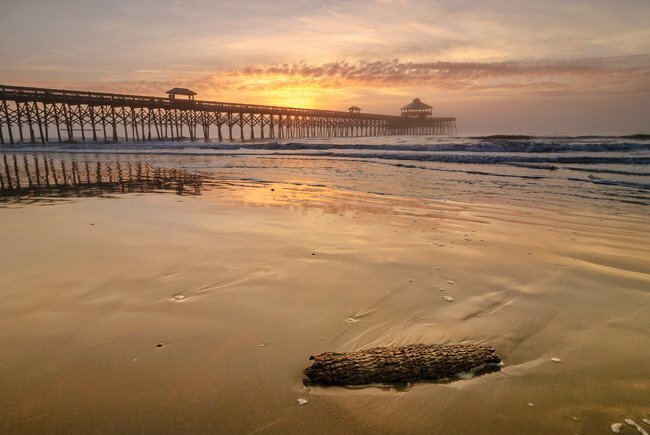 I just recently relocated to the South Carolina area and I can’t wait to experience this wonderful beach. I will be exploring real soon. I remember the plaza from the 1960s and 70s. In the early seventies high tide was right up against, and at times, splashing over the plaza wall. By the mid-seventies the amusement park and the pavilion as a whole were falling into disrepair. The pier was missing many boards and was kind of dangerous. However, it was open for fishing to the public. It was around those days that attendance was starting to fall off. The 1977 pavilion fire seemed to be the final nail. They tried bringing it back in the early eighties with some concerts, but the county park seemed to be the new attraction and people started going there instead. 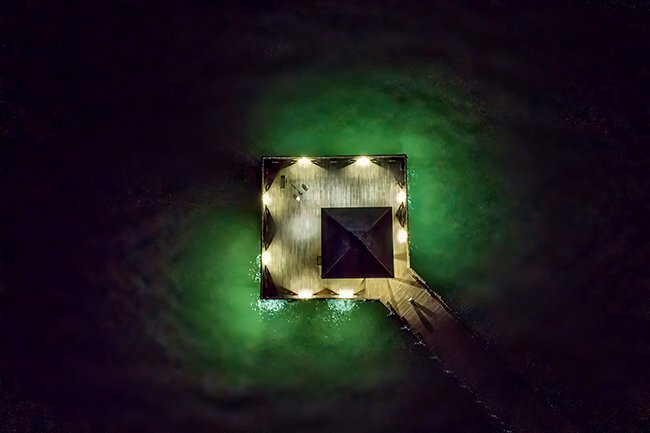 The pier did not burn twice. The Pavilion was built in 1925, and it was the one that burned in 1957; a temporary one was built and opened that summer in June of 1957. The Plaza opened in 1960 with a new Pavilion, cement boardwalk, arcade and other buildings. 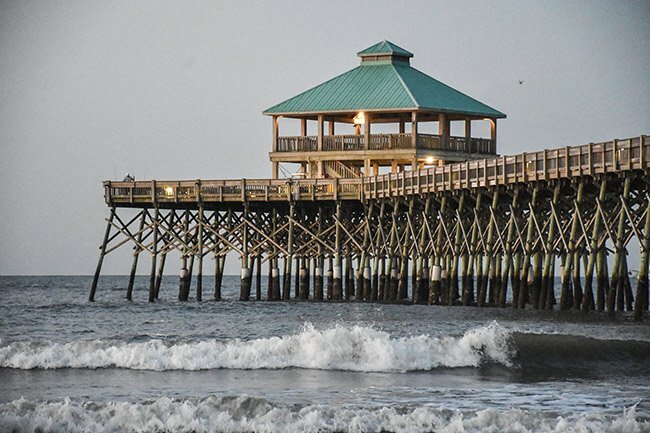 The large pier, over the water, was built in 1931 and was remodeled in 1960. It burned in 1977, and the plaza just didn’t make a go of it after that. Hi, Allison! I am posting a link to the town website. Hopefully, you can find answers to your questions there. 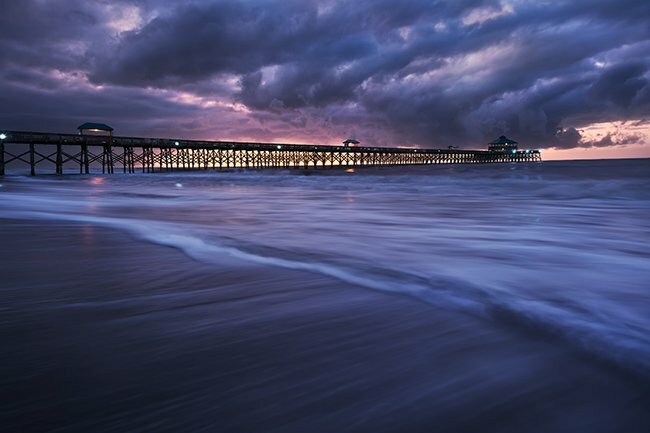 If you happen to get any good photos of the pier, we would love to share them!